‘How do I choose the best crochet hook?’ is a question we often hear. A simple question, without a simple answer, as you might suspect. As you can see on our site there are many different hooks in all kinds of shapes, sizes, materials and price ranges. What the best crochet hook is for you depends on a number of factors, such as use and budget, but also subtle preferences like the shape of the handle and a tapered or an inline head. Therefore, we give you this little guide to buy crochet hooks. A good way to start selecting the best crochet hook for your personal situation, is by looking at the handle. The handle is the end of the hook, where you hold it. If you buy crochet hooks with a handle that is too short, the hook won’t feel comfortable while crocheting. 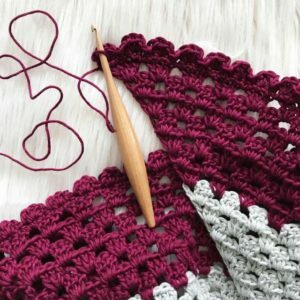 If your hand gets cramped up easily or you suffer from some form of pain in your hand (such as carpal tunnel syndrome), a hook with a long handle is most likely the best crochet hook for you. 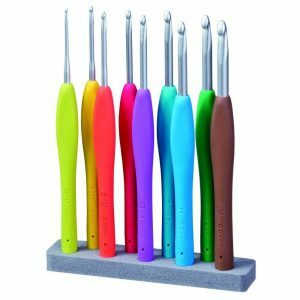 Our top brand for long ergonomically shaped crochet hooks is Furls, known for its beautiful designs and precious materials. Another aspect to look into when in search for the best crochet hook, is the thumb rest. This is the part of the hook where you rest your thumb. Not all crochet hooks have a specially designed area for this, but all our hooks do. Hooks with ergonomically shaped handles have the thumb rest incorporated in the handle. Popular and reasonably priced hooks that have a thumb rest include brands like Clover, with its cheerful and recognisable colours, and Tulip Etimo, with its comfortable soft grips. The head is the part of the hook that catches the yarn. You might say: the hook on the hook. There are inline hooks and tapered hooks, the difference being that an inline hook is more in line with the rest of the hook. It’s flatter and has a deeper, more pointed head. A tapered hook has a rounded head, that protrudes slightly beyond the rest of the hook. The best way to find out which is best for you is to simply try a few out. Can’t decide? Try our beautiful Furls Streamline for a nice compromise. We hope you have enough information to buy the crochet hook that’s right for you. If you have any questions: please ask – we’re always happy to help.